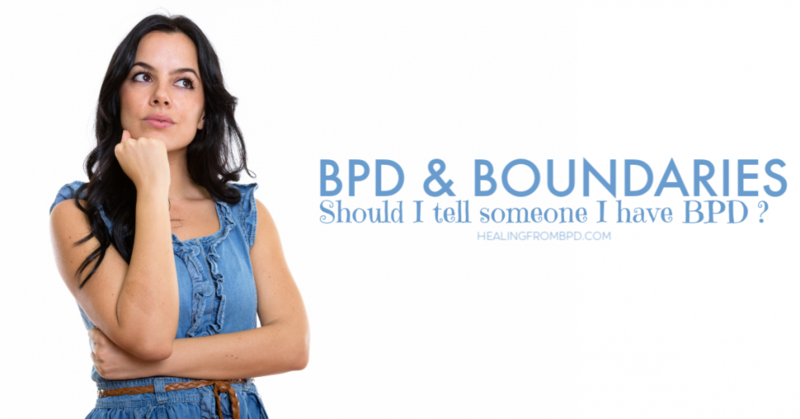 Boundaries: Should You Tell Someone That You Have BPD? 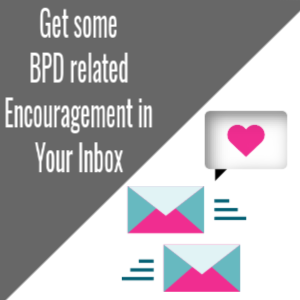 One of the most common questions I am asked by my readers is “Should I tell ______________ that I have Borderline Personality Disorder?” The blank is usually filled in with things like: my new boyfriend/girlfriend, my boss, my co-workers, people at my new school or church, and the like. Disclosing your mental health diagnosis is a very personal decision, and each and every time you are faced with it, the circumstances are incredibly unique, from the relationship you have with the other person to the potential benefits and troubles that could come from the disclosure. When it comes to new relationships, I err on the side of practicing strong boundaries. This is not something that I had the ability to do in the past. I felt that I had very little control over how much I told people — even people I’d just met at a bus stop. (I literally remember telling one woman so much about me by the time our bus arrived that I felt sick with regret.) I also remember my DBT therapist recommending that, especially in the context of a new potential partner, it’s important that the nature of disclosure grow as the relationship does and that it be reciprocal. For example, if your new date just told you that he or she really loves romantic comedies, replying with “Me too — oh, and I have Borderline Personality Disorder” is obviously inappropriate. 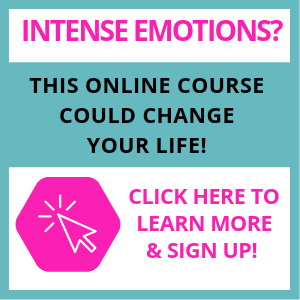 But, if you get to a point where you are both discussing more emotionally deep topics, and it feels like disclosing would be helpful to the building of the relationship and for your new partner to understand where you are coming from, then it may be something to consider. At some point, in the natural course of developing a deep relationship, I believe that something like this will begin to reveal itself and will come for discussion at some point naturally, in due time. You must decide, for yourself, what feels comfortable, right, and safe. No one else can know this or make this decision for you. For most people, this is not the case. Many of us work in offices, in professional careers, wait tables, tutor children. In these situations, what would be the value of disclosing that you have BPD? More than once I disclosed to an employer that I was mentally ill (before I knew my BPD diagnosis — I already had the aresenal of PTSD, OCD, and Generalized Anxiety Disorder to disclose), and in my own personal experience, in every case, I regretted it. In nearly every instance, I ended up revealing my mental health issues in a moment of panic and insecurity, and I believe it setup situations where I was judged or treated differently due to my disclosure. I realize that this is not the case for everyone. I’ve also spoken with a number of people who have said that sharing with their boss or co-workers that they have mental illness has created a closer bond and fostered a sense of truly being cared about in the workplace. So, just like disclosing your diagnosis in personal relationships, the choice of whether to disclose in the workplace is also highly individual and personal. There is much to consider, and only you can make the choice as to what is right for you in the long run. How have you handled this in the past? How might you handle disclosure of your mental health issues in the future? https://www.my-borderline-personality-disorder.com/wp-content/uploads/2018/12/healing-from-bpd-300x225.jpg 0 0 debbie https://www.my-borderline-personality-disorder.com/wp-content/uploads/2018/12/healing-from-bpd-300x225.jpg debbie2013-11-20 15:55:002019-01-13 11:06:00Boundaries: Should You Tell Someone That You Have BPD? Thanks for this useful post. I am currently trying to find a partner and never know at what point in the dating process to explain my mental illnesses. This makes me realise that I don't need to come out with it straight away, although I do still feel almost guilty about not telling people. It's such a difficult thing to deal with. Hi Olivia, it really is a delicate and often complicated thing. Thanks for sharing. What jumps out at me is a question. Why do we share too much too soon? I keep promising myself I won't do that again. Most healthy people do not like that, yet once more, I meet someone, start chatting, and realize after that I have shared way too much. Boundaries is something that I'm still working on, and it's a difficult one for me since I lived so long with none. But now I've come to a point that if it comes up (like being a mental health advocate, my current career path, and what I want to do with my life) I do answer openly about my BPD without disclosing too much (I've finally learned where to draw the line there in initial meetings). But even that can throw someone, and I'm fairly certain that potential jobs and friends have been lost because of the stigma this mental illness has. 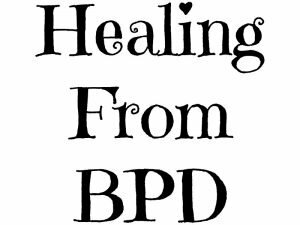 Those who are interested in my progress in overcoming my BPD as well as conquering anxiety applaud my efforts and stick around because they see past the label. And honestly, those are the kinds of people I'd rather have in my life. Hi Ashley, I think you make a great distinction about appropriate disclosure. In your current career role, it sounds like it's appropriate to share about your condition, yet you know where to draw the line. Thank you so much for sharing! Great post – thank you! I agree that it has mostly been moments of panic/insecurity that led me to disclose my diagnosis and it led to serious regret 99.9% of the time. Treating BPD like an excuse for my choices and behaviour made me feel almost (extra) dependent on it, and unfortunately, the bare truth is that as much as we would prefer everyone to understand and respect what we're saying, many people will not do any such thing. If you can't put your diagnosis out there without absolute certainty that you will be okay regardless of how the other person reacts (even if it's with horror, embarrassment, disgust, etc. – worst-case scenario), you shouldn't be saying it. That's my personal rule now, anyway. Wow! What country, if you don't mind me asking, Katie?